A rather expensive fraud, I think I'd much rather just buy a good honest Wepener to the Kaffarian Rifles and have a lot of change left over from my near £700! djb wrote: That's a shame. It was, on the face of it, a tempting proposition. Almost two for the price of one! With so many standard combinations of standard 4 clasp Wepener QSA, I always find it inviting to see some different clasps in there. 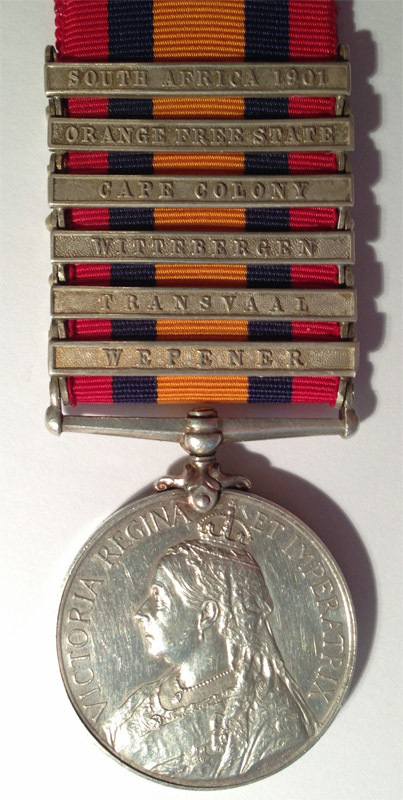 The advertising of a Wepener QSA to the ILH was an offer too good to miss. While the clasps are not quite correct and the rivets are not all they could be, the medal and clasps are genuine. The recipient is 1486 Pte R Collery ILH. He served in the CMR at Wepener and later transferred to the ILH. His career was not a happy one. He was tried and sentenced by a Court of Officers 4 Jul 1901 to 84 days hard labour and to be discharged for sleeping at his post. I purchased the medal from Medals4Heroes who I had not dealt with before. I would definitely but from there again. A very nice aquisition David,congratulations.